Did you know the council membership committee has plenty of free supplies and materials to assist with your recruitment efforts? We can make you flyers at no cost for Lions, Family Scouting, or traditional flyers in black and white. We have lawn signs, cardboard Scout cut-outs for flyer distribution, an inflatable Scout and more! You can also borrow a popcorn machine to give out free popcorn at your recruitment event. Need an activity do at your pack open house? We have STEM kits, fishing kits, and archery set up, rain gutter regatta, and a Pinewood derby track that can be borrowed to bring excitement to your recruitment. All of these materials are supplied by the many generous Friends of Scouting (FOS) donations families like you provide to Patriots’ Path Council. See the links in the right column. This is one method that can be used for recruiting in your town. 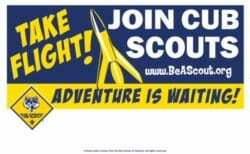 This is a recruiting initiative to have a couple weeks in September when families can join Scouting in each town. The plan is to have recruiting during the week of September in elementary school. Cub Scout packs and Boy Scout troops will run a pack meeting or will have demonstrations and exhibits. Scouting information including what Scouting is, parent responsibility, and how to enroll will be given to those present. Applications and fees will be collected that night. New Scouts will be invited to pack or troop and district Fall activities. Registration forms for upcoming training courses for new leaders will be distributed and collected. Please check back as some of these resources are being updated. BeAScout.org – please update your pack’s information that displays on the BeAScout.org website. Please note the Unit Leader, CC & COR have access & can designate someone in the unit as the point of contact. How to Update BeAScoutorg information. Site coordinators will collect applications, training registrations, and attendance sheets. Copies of applications will be emailed by council to unit leaders. The organizer and/or the membership committee will organize new units as necessary. New Scouts will be called to ensure they have been assimilated into a pack/troop. Many schools have approved Scout uniforms to be worn to publicize School Week for Scouting. Many schools welcome Scout leaders or Scouts into the school during lunch or assembly for a 5 minute boy talk. For more information on Scout talks, click here. If you need help with Scout talks, please speak with your district executive. There are a variety of steps that can boost your fall recruitment. The attached “Back Dated Steps for Fall Recruiting” lists these steps and back dates them based on the date of your fall recruitment event. But nothing can be promoted until the date, time and location of your event is confirmed. Some organizations are very slow to reply to your request for meeting space, so it is best to submit your request now. The sooner that you can confirm the details, the sooner that steps can be taken to promote the event. On the attached “Back Dated Steps”, if you enter the date for your recruitment event, the formulas will autofill the suggested dates for completing the steps. The dates are just suggestions but this is designed to be sure that you don’t miss deadlines and steps are taken far enough in advance to have an impact. Some steps may not apply to your pack (like mailing an invitation) but are listed to be thorough. Delegating the steps to a number of parents can lighten the load for everyone but one person should keep track of everyone’s progress. Many of these can be done by a parent who is not yet helping out with your pack. – New Family Scouting Recruitment materials are available. More flyers will be made available with “Scouts Me In” this Fall.